There is a place in Florida that does not have the very best in beaches, the most Caribbean-like climate, the best recreational opportunities or the hottest resorts or nightlife in the State. So, why is an island peninsula community of 15,000 residents on the Gulf Coast considered by many to be a “best kept secret”? For those in the know, it is an affordable subtropical nirvana. Its name is Anna Maria Island. Just south of Tampa Bay, west of Bradenton and north of Sarasota the town of Anna Maria holds this honor. The most remote and outlying town on the island of the same name, it combines with two other municipal communities to the south, Holmes Beach and Bradenton Beach, for the total Anna Maria Island experience. The secret is that the town of Anna Maria does not have any fast food or convenience franchises, chain stores, high rises or a stoplight and the community intends to keep it that way. Prominent destinations such as the Tampa, Clearwater or Sarasota areas are only 45 to 90 minutes away. I have yet to have anything but superior seafood, especially the grilled fish and stone crab claws, which I recommend most. Blackened grouper, roughy and snapper are my favorite fish entrees and conch stew or soup is my favorite appetizer. But be warned – as much as they try, even the best restaurants fail to replicate blue crab cakes indigenous to the Chesapeake Bay region. You will see these on almost every menu but order the regional equivalent, conch fritters, and you will not be disappointed. What Anna Maria does have is a Florida Keys charm of 30 years ago, spectacular ocean sunsets, solitude without remoteness, secluded beaches with sea turtle egg nests, wildlife, easy bike riding, friendly people, exemplary dining opportunities and a free local trolley. The late winter and spring throngs do affect the area somewhat and you might be surprised to hear a multitude of German-speaking visitors who seem share my family’s tastes. While not as crowded as other popular Florida destinations, mainland traffic access along the single causeway to and from the nearest city, Bradenton, can occasionally gridlock, and waiting for restaurant seating can be excruciating. For these reasons, northerners may best appreciate this eclectic community in August, when the coastal climate is cooler (high 80’s) and the sparse attendance is just right. This allows you to experience the otherwise camouflaged and friendly local beach populace of year-round residents – best described as a blend of small family businesses, artists, commuters, retirees and escapees from big cities with a slow-paced Mayberry quality and a smattering of international flavor. Bring paperbacks, sandals, shorts, swim wear and plenty of sunscreen but leave most of your clothes at home. A typical summer day starts out sunny and clear with an afternoon or evening thunderstorm like clockwork so schedule your outdoor time in the mornings and midday. The most challenging part of your stay might be deciding whether to go anywhere else. Popular choices include Siesta Beach, rated one of the world’s best beaches; Mote Marine Aquarium; Myakka River State Park – great for viewing alligators in the wild; the Ringling Museum and Selby BotanicalGardens in Sarasota; St. Armands Circle shopping district in Siesta Key and the Leffis Key Baywalk nature preserve near Coquina Beach. Anna Maria Island also has a unique and under-appreciated artistic community worthy of investigation. Here’s my pick of some of the most active groups; try to catch a show during your visit. The Island Players; Anna Maria Island Art League; Artists Guild of Anna Maria Island; Anna Maria Island Historical Society; Anna Maria Community Center are excellent local resources. Other locations of interest in or near the Town of Anna Maria include the Island Community Center where you check out local activities and events. At the Island Library in Holmes Beach, (941/778-6341), your family can surf the net, check your email and get some books for the kids and yourself. If you’re traveling with little ones, the Anna Maria Elementary School at 4700 Gulf Dr. N., Holmes Beach provides a delightfully secluded park and playground area with a memorable water view – and a screeching population of feral parrots and other non-indigenous tropical birds that were once pets. There are plenty of customary accommodation options, especially in the contiguous communities of Holmes Beach and Bradenton Beach to the south, but I recommend that for your first visit you make the total commitment of residing in the Town of Anna Maria itself. If beachfront accommodations are not a requirement, cut your costs without cutting comfort and amenities by staying at the Sunrise Garden Resort (941/778-2000). Created and designed by an enterprising couple – she from rural Thailand, this exotic lodging oasis of southeast Asian themes and foliage will envelope you in a bubble of slightly surreal seclusion in a quiet residential neighborhood of occasional pastel pink and purple homes. Room selections range from smaller studios to efficiencies and a honeymoon suite all surrounding a placid swimming pool sprinkled with Thai sculptures, antiques and flora. The compact and efficiently designed resort is strategically located within walking distance of both sides of the island shoreline, the community’s best restaurants, a small museum, a video rental, dry cleaner and a small general store. The owners thoughtfully leave laminated guides and maps to local attractions and a vendor list in each room. Lodgings, including house and condo rentals, are usually available by the week. If being at the seashore is your goal and you deserve more pampering, stay farther south in the Bradenton Beach area – a little more bustle but still an enriching experience. An especially cutting edge resort is the BridgeWalk, (941/779-2545) a good value since you are right at the Gulf beach. Rooms vary in style and capacity from studios to townhome-like suites. The BridgeWalk includes a restaurant with the best view in the area, shops and a spa. In most areas, the Gulf of Mexico will be to the west and Tampa Bay to the east. The best way to explore Anna Maria is by foot and bicycle – rent some at a shop near the general store and enjoy the flat and scenic terrain. If you feel adventurous, do it with roller blades. Some local and low maintenance activities within walking distance can begin with going right to the beach to soak in the warm and gentle blue waters. Read a book and beach comb. Try to find prize seashells and discover how this total focus makes the real world fade. Be careful with the deceptive water currents at the northern tip of the island, particularly with little ones. Beware too the midday sun – it may feel the same as up north but rays are near equatorial intensity. 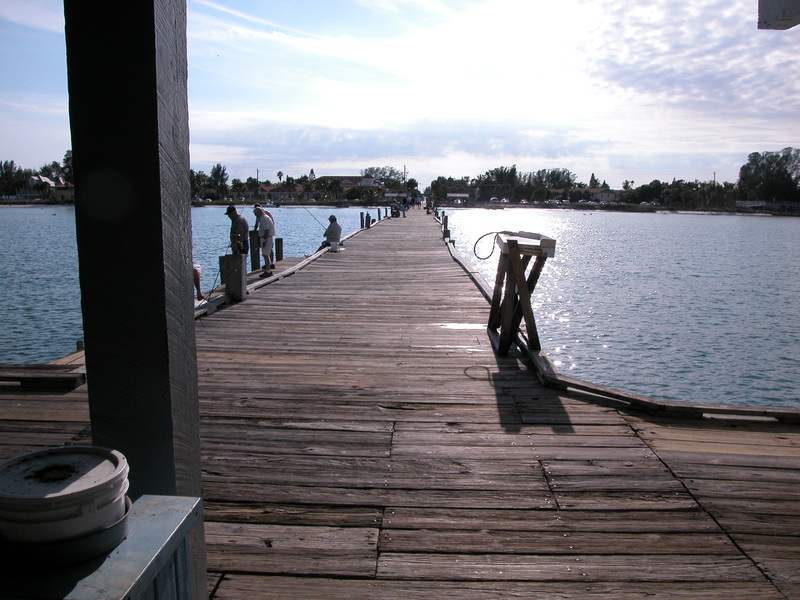 Try your hand at fishing on the Bay’s Anna Maria City Pier and eat at the pier’s over-water restaurant. On your stroll back, stop at Mama Lo’s, considered the best ice cream parlor in the area. Have a family cookout at the Anna Maria beach front park and play area on the Bay. Lounge by the pool but don’t forget to watch the Gulf sunsets each evening with everyone else. If you observe it from the area’s most popular beach front restaurant and bar, the Sandbar, guessing the sunset time may net you complimentary drinks. A word of caution – if you find yourself excessively scheduling and planning, you don’t belong here! Favorites among most visitors are the numerous boat charters (both sightseeing and fishing), ultralight air tours, kayak, jet ski and boat rentals and parasailing. The visitor literature in your hotel list numerous vendor sources. Sparsely advertised and modest in appearance, this secret and restored historic 1913 cottage serves the best food on the island and probably the region. The menu boasts an extensive and unusual variety of Florida and European selections as well as wines and beers – not inexpensive but well worth it. In case you are curious, the varied menu selections are based entirely on what customers request the most and the name of the establishment came to the owners in a dream. Probably, the most popular restaurant on the island due to excellent dining as well as an outdoor beach-front bar with music. Also a popular spot to buy souvenir T-shirts. If dining by sunset is your goal, inside or out, this is the place to be. Long lines and large crowds in peak seasons can sometimes make this experience a formidable challenge. For those of you comfortable operating a motor boat, consider renting a 17′ five-person outboard for the day. Motor out to Egmont Key, an uninhabited island in the Gulf at the opening of Tampa Bay. This “Gilligan’s Island” has uncompleted relic walk-ways and building foundations left over from turn-of-the-century Spanish American War fortifications and is presently overrun with large tortoises and lizards. Home of an old, still-operational lighthouse, it is also a wildlife refuge. The bay side of the island has the best snorkeling in the region. Budding young marine biologists will appreciate the easy shallow calm water over vast expanses of turtle grass beds. Just float and look down to catch glimpses of fish and bottom dwellers such as mollusks and rays. Make sure to bring plenty of drinking water, a picnic lunch and sunscreen. One of Florida’s largest and most diverse natural areas, this is 45-square-miles of wetlands, prairies, hammocks and pinelands. The river and its two shallow lakes attract a myriad of wetland creatures such as alligators, turtles, and an amazing number of different types of birds, and a boardwalk out on the Upper Lake enhances wildlife viewing opportunities making birding, canoeing, fishing and wildlife observation popular activities. A seven-mile scenic drive winds through shady oak-palm hammocks and along the shore of the Upper Myakka Lake. Over 39 miles of hiking trails and many miles of dirt roads provide access to the remote interior. Parasailing – I must confess I passed on this so far, but my son’s cajoling will make the inevitable happen with a future visit. You can arrange one at the rental facility near the general store or numerous other places around the island. Actually part of Sarasota’s Mote Marine Laboratory, it was founded by Dr. Eugenie Clark, world famous marine biologist and shark researcher. Naturalists, budding marine biologists is and those interested in fish, reefs, sea turtles, marine mammals and science will love it. Children will also like the hands on touch tank. Actually considered one of the best and beautiful beaches in the world on many Best Of lists, the beach’s sand is 99% quartz – so even on the hottest days, the sand is so reflective that it feels cool underfoot. Estimated to be millions of years old from Appalachian sediment deposition, Siesta Beach has a vast near-shore shallow water depth with year round lifeguard protection, playgrounds, bath houses, beach volleyball, fitness trails, athletic fields and parking (but get there early). If you simply must activate your suburban yearnings, there is only one place to do it. Created from a group of islands in the 1920s, by John Ringling of circus fame, world-class destination of St. Armands Circle on Lido Key provides contemporary architecture, superb shops, galleries, exotic boutiques, gourmet restaurants and nightlife. Sometimes described as a more affordable and less pretentious “Beverly Hills of Southwest Florida”, this continental market place of over 130 stores can reduce your charge card to crumbling debris. Almost anywhere along the seashore. Three miles south of Holmes Beach, opposite the shaded pine barrens of Coquina Beach, lies an under utilized nature preserve of wetland boardwalks and observable wildlife. It makes an excellent family walk. The region’s only U.S. Park is less of a recreation area and more of historical display of artifacts and reenactments with period costumes describing the life of expeditions of Hernando De Soto.